By default WhatsApp shows ‘last seen at…’ time to your contacts which signifies the time when you last used WhatsApp. Similarly, you can also find out when a person in your contact list was last online on WhatsApp by seeing the ‘last seen at…’ time. ‘Last seen at…’ is a great feature of WhatsApp as it helps confirm if a person has seen your message or not. This is because if you have sent a message to someone on WhatsApp and he or she is not online on WhatsApp since the time before you sent the message, then it means that the message is still unseen. ‘Last seen at…’ feature also raises some privacy concerns as some of us may not want to disclose publicly about when they last used WhatsApp. Until today, you had to live with it. But not any more. Now you can hide ‘Last Seen On’ time on WhatsApp. The ability to hide the ‘Last Seen On’ time on WhatsApp was added today so you need to update your WhatsApp app first. If you have not been using WhatsApp till now, because of privacy issues, you can download WhatsApp now to start using it. On your Android phone, first update WhatsApp, then go to Settings > Account > Who can see my personal info > Privacy, and select option to change ‘last seen’ status. Here you can select one of the three available options. • Everyone: All WhatsApp users will be able to see your ‘Last Seen on’ time on WhatsApp. 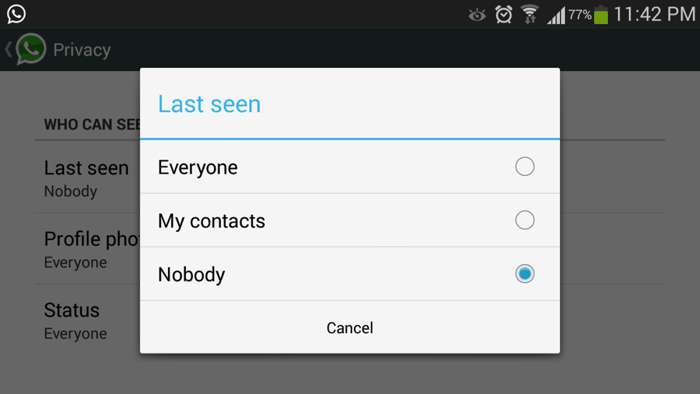 • Contacts: Only your contacts will be able to see your ‘Last Seen on’ time on WhatsApp. • Nobody: This is the newly added option that lets you hide ‘Last Seen On’ time on WhatsApp. Select it to prevent anyone from seeing your ‘Last Seen on’ time on WhatsApp. 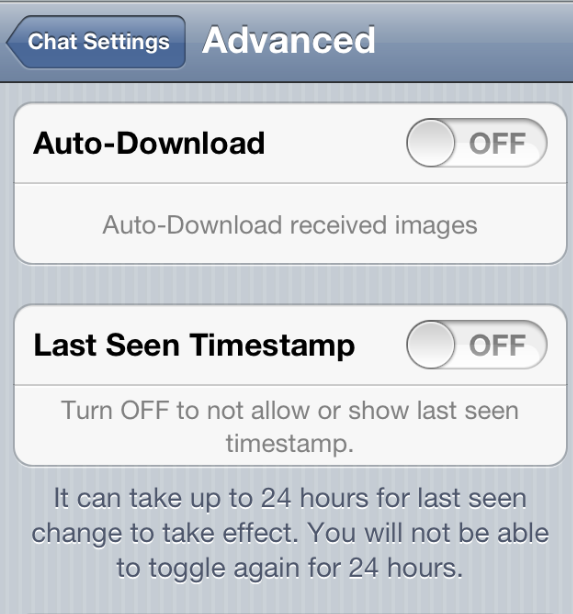 If you are on iPhone, update WhatsApp app to latest version and then go to Chat Settings > Advanced, and toggle the ‘Last Seen Timestamp’ to ‘Off’. The important thing to note here is that if you hide ‘Last Seen On’ time on WhatsApp from everyone, you will not be able to see the ‘Last Seen On’ time of others.